For some people, reaching the age of 70 is liberating, even invigorating. For others, it's emotionally a major challenge. 70th birthday wishes, done well, mark this milestone with care. Fortunately for you, that's the only type I have here. 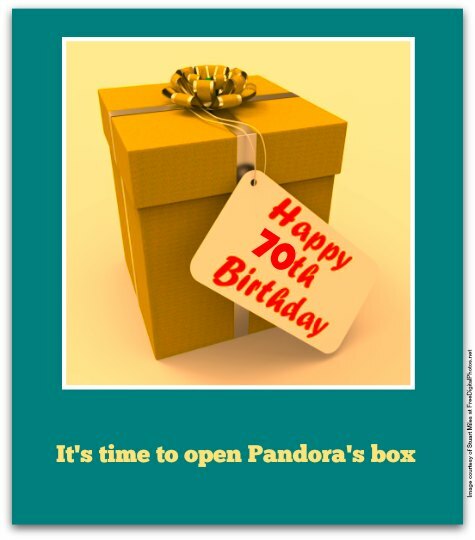 How can you be sure if the 70th birthday greeting you choose is right for your loved one turning 70? 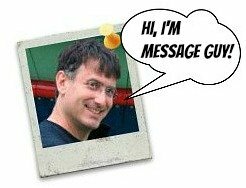 For a bunch of tips on selecting the perfect 70th birthday messages, take a moment to check out Message Guy Tip #70. What you'll learn is that you shouldn't go overboard with age-related jokes or insincere compliments. The best route to take with your birthday wish is the sentimental-inspirational path. That's the type of 70th birthday greetings you'll find here. You are the most loving, kind and encouraging person to everyone who knows and loves you. Happy 70th birthday! Happy 70th birthday! When I'm your age, I hope I'm fortunate enough to have your 70 years of wisdom, grace, compassion and love. Age is a state of mind. If you consider yourself 70 years old, you're merely 70. If you see yourself on a 70-year-old journey, you're an explorer. Happy birthday! Even at 70, you look like a 60 year old. I think it's time for you to give me a taste of your secret fountain of youth. I've never seen a more exquisite, more loving, more caring, more breathtaking 70 year old. Happy birthday, my dearest! Happy birthday! Hope your 70s will be as awesome as (or even better than) your 60s, 50s, 40s, 30s and 20s combined. Happy birthday! Even if I'm only a quarter as kind-hearted, positive and friendly as you are when I hit 70, I'll be able to change the world. Turning 70 means two things: You survived the 60s and you survived your 60s. Happy 70th birthday! Happy birthday! When you turn 70, everything needs to be larger than life. That's why there's large print. Happy 70th birthday! Don't be concerned that your precious youth seems to be slipping away from you — you can't expect to get a good hug from all your grandchildren! Happy birthday! When you're 70, the problem is not the fact that you've slowed down — it's that everyone else hasn't. When you turn 70, you deserve the respect that comes with your age. Unfortunately, life can sometimes be unfair. Fortunately, not for you. Happy birthday! 70 may be an awesome number, but not as awesome as you are! Hope you have an awesome time on your 70th birthday! Happy birthday! With 70 comes with a certain amount of maturity, so it's about time you stopped behaving like a reckless 60 year old. At 70, you may drive slower than your age in miles per hour, but now you can stop and smell the roses, violets, daffodils, lilies, tulips, whatever flower that interests you, whenever you want.